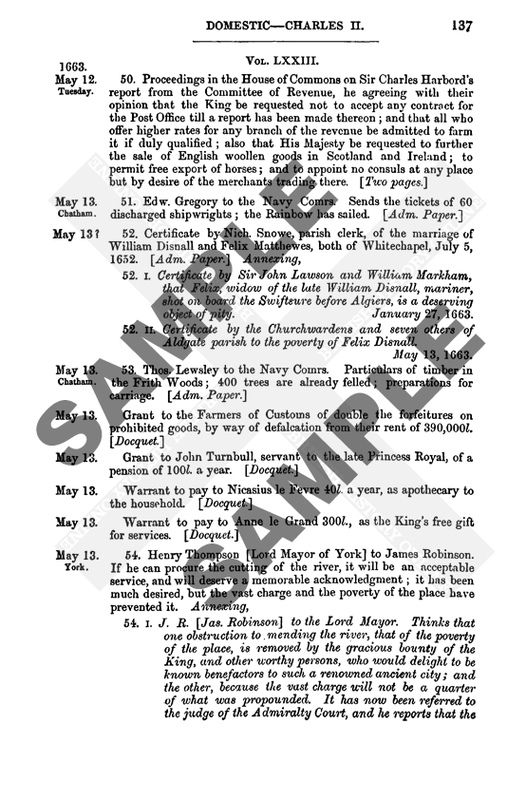 Calendar of State Papers Foreign: Elizabeth, Volume 4, 1561-1562. Originally published by Her Majesty's Stationery Office, London, 1866. 984. Hugh Typton to Challoner. 1. On the 3rd inst. received Challoner's letter of the 26th ult., perceiving thereby that he had received his [Typton's], sent by Humphrey Riquethorne, and since by the courier with the letters of the men of Bristol. As Peter Mellendez is embarked they determine to depart for England. He showed them Challoner's letter, for which they thank him. Is informed that the Queen wrote to Chamberlain concerning this matter. The opinion of the writer is, that there may be a lawyer and a procurator to follow the matter at their cost, and there is no doubt that they will have remedy for their wrongs. Frampton is at liberty, but the owners of the goods found in his possession cannot as yet have them restored. Is sure the goods do not belong to Frampton, for he has information from the owners to recover them. Concerning their privilege of St. George's chapel, their request is, that the King will confirm that which the Emperor granted to England, as appeared by the records there. 2. Concerning the memorial Challoner sent, he sees how the matter stands. He has conjoined with Anthony Macnello, who has recovered the money, which may be by his saying 530 or 540 ducats, and he declares to the writer that the party who gave him commission to recover the same promised him the third part of the same for his costs and trouble. 3. Concerning the "Gwadameceles," when it pleases Challoner to give order for them he will do all he can therein.—Seville, 6 April 1562. Signed. Orig., with seal. Add. Endd. by Challoner. Pp. 3. 1. Has at length obtained the divorce which Cecil so earnestly wrote for. Is required by Sir John Balendine, Justice Clerk, that nothing should be wrought thereby prejudicial to the Earl of Angus here in Scotland, unto whom he is a special friend. Being altogether ignorant of the purpose, Randolph promised him, is fain otherwise to use his friendship. "Your wisdom best considereth what such a friend is worth." If the Queen will give him [the Justice Clerk] licence for a couple of geldings, he will think himself much bound to her. 2. The treason against the Queen, the Earl of Mar and the Laird of Lethington was also intended to as many of the nobles as had been in company at the time of the execution that resisted. The Earl of Arran being asked by the Earl of Argyll what they would have done with him answered that he should have gone with his marrows. 3. After the Earl of Arran came to the Laird of Grange's house, either for fear of his life that his father had put him in, lack of sleep, meat, or other accident, after he had taken some rest he began to rave and speak strange purposes, as devils, witches, and such like, fearing all men that come unto him that they came to kill him. 4. The Queen being advertised hereof sends the Earl of Mar to him, who that night (Tuesday in Easter week) brought him to the Court (being at Couper), with whom he declared many tokens of an unquiet mind both in his talk and doings, and so continued the whole night. The next day the Queen removed from Falkland to St. Andrews, the Earl of Arran being in company; the Earl of Bothwell and the Abbot of Kilwinning being sent before by certain of the guard to the castle of St. Andrews. They have been examined, but confess nothing. The Earl of Arran is very well come unto himself, but not so constant in affirming what he wrote. The Queen has spoken with him and he will under conditions declare the verity. She will receive no such conditions; either he must justify his own letters or confess his evil disposed mind, and great fault against his Sovereign so to have written to her. He is quietly attended upon by such as are appointed, not of his own. The Queen willed Randolph to speak to him upon Friday last. In all common purposes he found as at other times good and resolute answers. When he entered in purpose with him of the cipher which he willed to be deciphered, he said all those things were but phantasies, and "I know not how God has suffered me to be deluded with devils and witches." When Randolph demanded what witches, he said the Lord James' mother. This he had said before the Lord James and divers others. In all matters save the conspiracy his answers are plain and ready. His father remains at Keneil; he has not yet written to the Queen, but laments that his son is out of his wits. It is said that twice before he was in the same case, and that he takes it of his mother, who is dead, who with both her sisters (who are married to the Lords Morton and Maxwell,) are most part of the year distempered with an unquiet humour. Of these purposes it pleased the Queen to talk with the writer. "She showeth herself not a little offended with the Earl Bothwell, unto whom she hath been so good, and doubtless, I think, shall find little favour. She readeth daily after her dinner, instructed by a learned man, Mr. George Buchanan, somewhat of Livy." She found in Cato's Oration against those who would have legem Oppiam abrogatam, the words "Hominem improbum non accusari tutius est quam absolvi." If the Earl of Arran had behaved well and confirmed with his mouth what he wrote to the Queen, he would have won great favour of all men; now he groweth out of credit with all men. Some would make it a forged matter for the hatred that is borne to the house. "The appearance hereof is very small, and I think the end will show the contrary." Is willed by this Queen to inform the Queen of England of this case. 5. The ministers are assembled to confer upon the appointment of livings in every shire. The 20th inst. the most part of the nobles are warned to be in this town, before which time there will be no resolution taken of the interview. 6. Has just received Cecil's letter of the 27th of March, for answer to the chiefest point of which he refers him to the beginning of this, and retains Cecil's informations for that matter. If he wants it more authentic, the matter must be more open, "whereof neither you nor we have any great goodwill. It is copied by the Justice Clerk himself, "and I heard it conferred with the principal. If more be required, it shall be a hard mischief that we cannot find a shift for." 7. Looks daily for Butshead, and is advertised by the Earl of Argyll that Macconel is the loather to depart from him because of the knowledge of his country. Purposes to send to Berwick for the angels, to have them ready at his [Butshead's] arrival. Is required to remind him of the Earl of Argyll's mother-in-law and her husband. It is bruited that Lord Darnley is conveyed into France, and that the young Laird of Bar has lost his head.—S. Andrews, 7 April 1562. 8. P. S.—This day the Earl of Arran is sent into the castle of St. Andrews rather in terrorem quam ad pœnam. He would now go from all that he wrote. Before he wrote to the Queen, in as good health as ever he was, he broke the same matter unto Mr. Knox, and by his advice and persuasion revealed it; and that does Mr. Knox verify to his face.—Signed. Orig. Hol. Add. Endd. by Cecil. Pp. 6. 1. Wrote to him by Captain Wallace, and sent to his wife one dozen of knives. Hears that he is like to have a successor, which puts him in hope shortly to see him at this purposed interview of the two Queens, "which now stayeth upon so little that I look daily when the Laird of Lidington shall be despatched hence towards my mistress with this Queen's request to that effect, and therewithal to appoint time, place, and to take order for many other things that are to be considered in so weighty a purpose." Requests to know the name of his [Throckmorton's] successor, that they may communicate with one another. Sir Thomas Smith is utterly unknown to him but by name, so that unless further conference by letters ensue, some occasion of service may be omitted. Has now a grievous case to open, although the danger is past and the authors inciderunt in foveam quam fecerunt. The great debate between Arran and Bothwell, which could not be accorded by all the means their Sovereign could devise, has lately ended, and Pilate and Herod have become friends. The Earls of Mar and Argyll and Lethington should have been slain, and the Queen imprisoned in Dumbarton. There are suspicions that the Duke himself is not free. Arran, after he had got his full consent, detected the conspiracy by letters written from his father's house, Keneil, to the Queen and Mar, then at Faulkland. The Duke, having suspicions of his son, intercepted the Queen's answer, which was written to confirm him in his honest mind. The Duke then threatened his son and put him in such fear that the next night he, lying in his chamber alone, descended by means of his sheets, blankets, etc., above thirty fathoms out of a window in his hose and doublet, and travelled from Easter Eve straight upon his feet until Easter Tuesday, (fn. 1) that he came to the Laird of Grange's house, whence he wrote again unto the Earl of Mar that he desired to come to the Queen. 2. In the meantime Bothwell arrived at the Court, thinking to have purged himself, but he was committed that night to the guard, and next day sent to St. Andrews Castle, straitly kept. The Abbot of Kilwinning, a Hamilton, one of the Duke's chief counsellors, and others of that surname were sent forth, as Arran says, to stay him. The Abbot thought to have borne out the matter as Bothwell did, but is presently in St. Andrews Castle, and one or two others of lesser reputation. 3. On Tuesday Arran came from Grange's house to the Court. "Whether it was from extreme fear of his life, being threatened by his father, long watches, great travail, or some natural inclination thereunto both of father or mother, but that night he became stark mad; his head full of imaginations that every man that he saw came to kill him, with many other fond toys, pitiful to speak] of, and grievous to be remembered in a man of his estate. He is now somewhat better, but always saith that he is bewitched. He is presently at St. Andrews, well kept, and used as a man ought to be in that case. Of this madness of his some conjecture that the former advertisement against the Earl Bothwell proceeded upon like humour. The matter is otherwise too manifest, and therefore your Lordship may easily conjecture what he hath deserved. How the other shall be restored to his wisdom, it lieth in the hands of God." 4. As for the Abbot of Kilwinning, his flock shall be never the worse fed, though his head were from his shoulders. The Queen in this case both honourably and stoutly behaves herself, determined neither over remissly to behave herself, nor yet so reasonably to deal as may be anything against her reputation.—7 April 1562. Signed. 5. P. S.—The Earl of Arran, going back from that which he wrote, was this day sent to the castle of St. Andrews to be kept rather ad terrorem quam ad pœnam. 987. Declaration of the Prince of Condé. "Declaration by the Prince of Condé, showing the reasons which compel him to undertake the defence of the royal authority, of the government of the Queen, and of the tranquillity of the realm; with the Protestation required." 1. As they who take up arms on their private responsibility ought to give a reason for so doing, the Prince (in order to avoid all calumny) has thought good to declare the causes which have moved him and his relations and friends to do service to the King, the Queen, and the realm, in this their great necessity. 2. Everyone knows that after the great troubles on account of religion in January last, the King addressed an edict to all his Parliaments, which was published in most of them; and if the Parliament of Paris had not delayed, there is little doubt but that the troubles in that town would have been allayed. 3. This delay has filled the minds of many with suspicion, and the Constable had held out certain hope to several merchants that this ordinance would not last long. All this time the members of the reformed Churches (although suffering from outrages for which they could get no redress) have waited for the publication with great patience. Which being done at Paris, rather at the entreaty than by the command of the King and Queen, the Prince of Condé being grievously ill retired to his estates. 4. After this news came of the horrible carnage at Vassy in the presence of the Duke of Guise, which was committed on an assembly of unarmed men, women, and children, who were worshipping in accordance with the pure religion and the Word of God. This the said Prince will always maintain by all legitimate means. 5. The news of this moved the two parties in Paris. The report spread that the Duke was coming with a great force to exterminate the reformers; whereupon, as the King did not seem able to protect them, they were obliged to stand on their guard. They had already sent to the Queen Mother to demand justice for the murders perpetrated at Vassy. The Prince of Condé, going to Monceau at the command of the Queen Mother, advised her (for the avoiding of troubles) that the Duke of Guise should be ordered not to go through Paris with his armed company, which was done. 6. Although it was hoped that the Duke would disarm his company and stand his trial, yet the only answer which he gave was that he was detained at Nanteuil feasting his friends. He then came to Paris with a great company all armed, and excused himself for so doing on account of his fear of the Huguenots. His followers had been collected a long time before from all parts, and if he had only sought his safety he would have gone at once to the Court according to the King's command. His coming had been determined for a long time, for not only did the Constable and others join his party, but also the Provost des Marchands, numerously attended, went to meet him, and conducted him into the town with as great acclamations as if he had been the King himself. 7. The Prince (who had come from Monceau the day before on his way to his house) suddenly hearing of this entry determined to stay, being moved by the earnest entreaties of the poor people, who feared that they would be treated as those at Vassy. He went to hear a preacher, accompanied by certain gentlemen who happened to be in Paris with their servants, in all 200 horse, armed for their defence, but who behaved quietly. On the morrow, finding that the Duke did not go to the Court but strengthened himself in the said town, the Prince did the same. Besides this the Duke with the Constable, the Marshal St. André, and some others of his companions, held their council, assisted by the Presidents of the Court, the Provost, the Echevins de Ville and others, as if they had been the King's Ministers. All these things show that there is some conspiracy amongst them. Six weeks ago, when the Constable left the Court, (having disgusted the Queen Mother by his strange proceedings,) happening to meet her and the King he neglected to salute them. A few days before the Marshal St. André, being expressly commanded to retire to his government, not only refused, but replied to her in full council so arrogantly, that it was plain to see that he relied on some secret intelligences. The Duke of Guise also since his arrival employed every means to keep the Queen Mother at Fontainebleau, fearing she should go to Orleans, and said as an excuse for his staying in Paris that the Prince had a great number of gentlemen in that town and that they were afraid lest it should be sacked. The Prince, however, had taken away that pretext by offering, through the Cardinal of Bourbon, to leave the town by one gate if the Duke would leave it by another. Afterwards, hearing that the Queen Mother desired that both parties should quit the town, the Prince showed himself so prompt to obey her that, though he had been ill in bed for two days, he left immediately with all his company, hoping that Guise would do the same. Guise, however, went to the King with all his forces, and kept him, the Queen Mother, and M. D'Orleans, contrary to his will, as was shown by the King's tears and conversation when he was obliged to go to Melun. This proceeding was nothing more than a capture, and he reminded the Queen Mother of the warnings which had been given by various persons. Having made themselves masters of the King and the Queen Mother they intend to use their authority against the Prince of Condé and such as resist their enterprises. 8. If the Duke of Guise and his party think themselves safe in this matter, it will be better for them to clear themselves, according to the request of the Estates, than thus to move earth and heaven, and cause people to think that they fear investigation. Their intent is to remove all hinderance to their disposing of the whole kingdom of France at their pleasure. Their design is to exterminate all those of the reformed Church, that is to say, all those who resist the making a new edict, ruining half the kingdom in order to have the rest at their devotion. 9. Taking all these things into consideration, the Prince declares that the duty which he owes to God, and His Church, his duty to the crown, and his earnest desire for the tranquillity of the kingdom, compel him to employ every legitimate means to deliver the King, his mother, and his brethren from captivity, and to maintain the decrees respecting religion. The Prince, together with numbers of noblemen and people of every degree, begs all good subjects to read and weigh carefully the above-written manifesto, in order that they may not be beguiled to aid the house of Guise, but rather assist in supporting the tottering throne of France. He also further implores the aid of all the Kings, Princes, and others the allies of France. He declares that he and his party are innocent of all the bloodshed and calamities with which the kingdom is threatened, and that they intend to oppose to the last the violence of the house of Guise. He warns all loyal subjects not to put faith in any decrees issued in the King's name whilst he is in captivity, it being notorious that they are extorted from him by open violence. He is ready to recognize the King of Navarre according to the rank that he holds in the kingdom. 10. He proposes the following conditions, which cannot be refused by those who prefer the peace of the realm to their own private ambition, namely, that the King, his mother, the Duke of Orleans, and the Chancellor, be set at liberty; that all arms be laid down; and that the Duke of Guise, the Constable, and Marshal St. André retire to their own estates; that a day be appointed on which they shall appear before the King and the Queen Mother to render an account of their proceedings; and on his part the Prince professes himself ready to do the same.—Orleans, 7 April 1562. Signed: Loys De Bourbon. Copy. Endd. Fr. Pp. 8. 1. Arriving at Paris on the 6th inst., he found three of Challoner's letters. At his departure from Orleans hitherward, within a mile of the town, a thousand handsome gentlemen, well mounted, each having two or three daggs, galloped towards him, and by the way he met as many more, all which possess the town of Orleans with strict guard at the gates, meaning rather to make further advancement than to leave off. The chieftains are the Prince of Condé, the Admiral, and D'Andelot. Paris he found in arms, into which the King yesterday made his sober but not solemn entry. He sees here the beginning of a like tragedy that passed between two brethren in King Edward's time with them. 2. Trusts he shall have his passport and be going tomorrow. Is sorry for the disgraces Challoner writes of Sends his commendations to him, Mr. Cobham, the Conte De Feria, his lady, "my young Lord," Mrs. Clarenceaulx, and Mrs. Stradling. Challoner is to tell "my Lord" he is sorry his luck has been no better with such things as he thought to have pleased him withal. 3. Desires Challoner to get a passport and send the gloves de flores and silk hose that Mr. Meliodus Spinola has provided for him by the first post to Mr. Gresham in Flanders. Secretary Gallars would shortly get a passport for them.—Paris, 7 April 1562. Signed. Orig. Add. Endd. by Challoner. Pp. 3. 989. Mundt to the Queen. 1. As soon as her courier came to him at Strasburg the writer set out with him to visit the Duke of Wurtemberg, who, however, as he found, had gone with his wife to inspect the building of a new citadel, one day's journey from Stutgard. Followed him thither, leaving Francis the courier behind. When the Duke was informed that the writer sought an audience, in about half an hour he was brought to him. He delivered his letters and explained his instructions, to each of which the Duke afterwards replied singly. To the first article he said that there was a certain Englishman at Trent who represented that he was an English Bishop, and that he was at the Council in the name of England; it was satisfactory to hear from Mundt that he was only a refugee. To the second article, as to whether the Queen had notified to the world her reasons for not sending to the Council, Mundt replied that she remained firm to the answer which she gave last year to the Ambassador of the King Catholic, and that most especially she intended steadfastly to abide by the agreement made betwixt her and the Protestant Princes at Naumburg last year, and she trusted that they would do the same on their part. Moreover, as she had heard nothing of importance from them for a long time, she was induced to send him to the Duke in order to know what they intended to do in respect of the Council, since a mutual understanding was of the greatest importance, nor should the defenders of piety and true religion be vanquished by the diligence of the votaries of pride and superstition. 2. To this the Duke replied that some months ago certain divines and lawyers had assembled to compose a Refutation of the Council at the command of the Princes, but that in the opinion of some it appeared not to be sufficiently decidedly and carefully drawn up; it was hoped, however, that the writing would be reduced into a proper form within a few days, and offered to the Palatine to communicate to the other Princes. Already the Elector Palatine and himself had been commissioned to send a complete copy to the Queen and the Electors of Saxony and Brandenburg. Would do the same for the Kings of Denmark and Sweden, and the Estates would ask the Queen to send one copy into Scotland. 3. The Princes and States of the Confession of Augsburg would shortly send commissioners to determine about the Council, and the best way of publishing the rejection of it. Mundt asked that it might be sent to the Queen by some nobleman who understood the matter, and also that she should be informed what place had been appointed for the assembly, as if she had timely notice she possibly might send an envoy. The Duke answered that he could not at present say anything certain about this, as it had not been yet settled, but that when it was, he would let him know. On Mundt mentioning the names of all those States who had bid adieu to the Pope, the Duke said that a French envoy (named Rambouillet) had lately proposed a league between the Protestant Princes and the French, but that the time had not yet arrived, nor could there be any firm alliance unless unanimity of faith and doctrine preceded it. He feared that the restitution of Calais would be found to be very slow and difficult. He asked also about the Queen's marriage, to which Mundt replied that he knew nothing about it. The Duke said that he was very glad to hear of the progress of religion, and did not doubt that the Queen would continue in her course, notwithstanding the impediments of the followers of the Pope. He was sorry for the waverings and strife in the French Church, and had lately written to the Queen Mother and the King of Navarre that the Queen would aid them, so that they need not fear the threats of the Papists.—Stutgard, 8 April 1562. Signed. Orig. Hol. Add. Endd. Lat. Pp. 4. 1. Has written to the Queen about his embassy to the Duke of Wurtemberg. These matters are of great importance in these difficult times, when the adversary of truth, under the pretence of piety, strives to reduce them to lasting slavery. The Protestant Princes are sufficiently eager for the work, but he does not think that they do enough in merely correcting abuses and errors. It is easy for the Pope to promise reform if he might retain his sceptre and dignity, but they ought by the sword of the Word to turn him out of the seat of the scorner, as he is already ejected from the conscience and affections of most people. If he escapes from this conflict, there is nothing that he will not dare to do. Henry VIII. was the first Prince who opposed the monster, justly calling himself head of the Church committed to his charge. The Papal reserve are now using their last resource, of which if they are now deprived they can no longer frighten the Protestants with threats of Councils. This common danger requires them to collect all their forces, trusting in the Lord, but not forgetting that He helps those who help themselves, and fortune favours the brave. 2. Although the journey was long and difficult, the writer resolved to visit the Count Palatine and the Landgrave. This unexpected expedition will be difficult for him, (and he cannot detain the Queen's courier more than three or four days,) for the purchase of horses and hiring of servants in a hurry demand a large outlay, and the Queen wishes him to remain for a resolute answer. Could not write sooner, as Francis will go before the ordinary post, and their post did not start on the last of March, as all the merchants were at the fair at Frankfort. Will write speedily to the Queen.— Stutgard, 8 April 1562. Signed. Orig. Hol. Add. Endd. Lat. Pp. 3. Has received such sorrow by Cecil's letters of 24 March as by any misfortune that ever he had by God's punishment he never received more; no, not even by the loss of his parents. In answer, Cecil should remember that he always acknowledged himself unmeet for this charge, and should suspend his displeasure until he calls the writer home. Leaves the excusing of Mr. Thomas to his own letters. The Ambassador advises that they do not remove out of Paris, because the troubles are so great, and spread all over the country, and the great men bent so much one against another. Paris will be the quietest place, for that the King is to continue there. Received on 2nd inst., by Mr. Fitzwilliams, governor of the merchants of Antwerp, 300 French crowns.—Paris, 8 April 1562. Signed. Orig. Hol. Add. Endd. Pp. 2. 992. Draft of the above. Hol. Endd. : 8 April 1562. M. to my master, from myself. Pp. 2. 993. Randolph to the Queen. 1. Is earnestly required by this Prince to signify to her of the imprisonment of the Earls of Arran and Bothwell, as also how void she is of that which perchane some surmise, which is a desire to be revenged of such as at other times she has conceived evil of. The effect is thus. The Earl of Arran (after having refused to put the controversy between Bothwell and him into the Queen's hands, and would accept no other conditions but that the Earl should deny his words at the Market Cross with sound of trumpet,) immediately after the Queen's departure from Edinburgh, by his own seeking agreed with him [Bothwell] to slay the Earl Mar and Lethington, to possess the Queen, and to rule the country at their will. This was discovered by Arran himself in letters at great length written with his own hand, one to the Queen, one to the Earl of Mar, and a third in cipher, "which he wrote that I should decipher, for that I knew it." He was at this time at his father's house, threatened (as he says) to be slain by his father, who had got knowledge that the matter was discovered. In the night he slipped out of a window by ropes made of his sheets about thirty fathoms, and travelled in his doublet and hose alone from Easter Day at night until Tuesday morning, when he came to the Laird of Grange's house, where he rested part of that day and came that night to the Court, and there confirmed by mouth in the presence of the Queen and Lords what before he had written. After supper he entered into so many vain purposes of devils, of witches, of murder and like, that from Tuesday night till Thursday morning all men judged him besides himself. After some repose these fantasies left him, and as the writer is witness, he never saw him better; being required by the Queen to see him. The same day he confirmed in the hearing of the Duke of Argyll and others what he before had written. 2. The conspiracy thus opened, Bothwell and the Abbot of Kilwinning were both apprehended, "men of their own nature prepared well enough to any mischief." On examination there appeared very little of any such attemptate. Arran abides not constantly by what he wrote as before he did, but rather denies the whole. The Queen, by advice of her Council, has commanded him to custody in the castle of St. Andrews, and he has nothing changed of the mind he was of at his entrance. 3. That the Queen is not moved with any evil mind towards the Duke or the Earl, the writer (besides what he has heard her say) will declare that he has observed that she always sought more to win their good-will than they had will to acknowledge their duties as subjects unto their Sovereign. She is not ignorant of the affection of many in this realm towards that house, how many they are and how allied, wherein to attempt anything against them unjustly, or that should not be manifest to the world what their fault was, should be to her own ruin. These things and the like are no small stays to the appetites of men's wills, and much more unto hers, being a woman, being lately returned into a country where never yet such obedience has been given to the Prince as is due. She has used his father, himself, and their friends with all gentleness, the more to let them know and the world judge that she loved them as kinsmen, and esteemed them as her successors. Unto the one she promised a reasonable support towards his living during his father's life, and remitted unto the other many things that he was in danger for, both in body and goods. After the detection of this crime, she judged so well of the Earl of Arran's sincere meaning that she devised with the Council what yearly sum she might bestow upon him. What grief this is to her heart. has appeared many ways, and she wished it could be known to Queen Elizabeth, without whose advice Randolph believes she will not hastily determine anything against the one or the other. Reports nothing but what he dare verify in her presence. Towards the Earl Bothwell her benefits have been too great for any man to think that anything should be intended to him, but always more favour than his deserts. For the Abbot, it is long since that he deserved much more than many judge that he shall receive. —St. Andrews, 9 April 1562. Signed. Orig. Hol. Add. Endd. by Cecil's secretary. Pp. 5. Warns Cecil that he will shortly hear some news of their metropolitan for saying Mass upon Easter Day. Would like it all the better if the Bishop were in hands with one or two or more until the interview were past. Was required to write to the Queen. His trust is greater in her pardon than in any liking of his well doing. Cecil's favourable word of his well meaning may advance his desire to have that accepted. The bearer is servant to the Grand Prior, his name is Malvasier. He has letters from this Queen to Queen Elizabeth, who has heard of two Almains that were returned from Berwick to the Court.—St. Andrews, 9 April 1562. Signed. Orig. Hol. Add. Endd. by Cecil's secretary. Pp. 2. 995. Lord Dacre to the Privy Council. Met Mr. Maxwell yesterday at "Greatna Kirk," where they delivered for five bills of attemptates on either side, and have appointed to meet again on the 29th inst., and in the meantime have agreed to meet at Carlisle and to file such bills as are not yet filed. The Grahames will answer for none of the inhabitants besides their own sons and servants dwelling between Eske and Sarke, because it is out of their lease, which was lately the debatable ground and now the Queen's inheritance by division; and also because the principal evil doers dwell there who have committed attemptates in Scotland, for redress whereof Maxwell has called very earnestly upon the writer. Asks that some may be appointed to answer for them, and also that fortifications be made there, as well for keeping them in due obedience and strengthening the frontiers, as also to countervail the forts of Annan and Langholm. Is informed that stone and lime are provided for the fortifications of Langholm this summer, otherwise he will be forced to burn and devast them, as Maxwell did yesterday certain of Scotland, who refused to answer at the day of march.—Rowcliffe, 9 April 1562. Signed: William Dacre. Orig. Add. Endd. by Cecil's secretary Pp. 2. 996. Lord Dacre to Cecil. Has written to the Council of meeting Mr. Maxwell yesterday. The Grahames declare that they would answer for none besides their sons and servants dwelling between Eske and Sarke, it being out of their lease, and the Queen's inheritance by the division of the "battable," where the principal evildoers dwell. Desires, therefore, to know who shall answer for them before their next meeting, which will take place on the 29th inst.—Rowclif, 9 April 1562. Signed: William Dacre. Orig. Add. Endd. by Cecil's secretary. Pp. 2. 997. Throckmorton to the Queen. 1. His last letters of the 1st inst. advertised her that the Prince of Condé was then ten miles on his way from this town towards Orleans, at a village named Longjumeau, accompanied with 1,500 horse; and that when his force was strong enough, he minded to repair to Fontainebleau, where the King was, with the King of Navarre, the Constable, the Duke of Guise, and all their force. The Prince's project being discovered or suspected, the King of Navarre, the Duke of Guise, and the Constable persuaded (some say constrained) the Queen Mother to remove with the King and the Duke of Orleans from Fontainebleau to Melun (a town strong enough for all sudden enterprises), where the King tarried four or five days. The Prince (not being strong enough to encounter the other party, and perceiving the King had retired to a strong place,) marched towards Orleans. His determination being understood, M. De Gonnorre, brother to Marshal Brisac (accompanied with M. De Frêne), was sent to the Prince from the King, to desire him to lay down his arms and repair to the Court with his ordinary train. The Prince said he would not believe that the King would command him to disarm, seeing his enemy the Duke of Guise was the first to take up arms, and in the same manner did remain at Court; therefore he [the Prince] would not abandon his force until the Duke of Guise were disarmed, which was reasonable, considering he was a younger brother of the house of Lorraine. MM. De Gonnorre and De Frêne returned to the Court with this answer. 2. Upon this declaration to the King of Navarre and the rest, M. De Tree, Master of the Ordnance, was despatched to reside at Orleans as the King's lieutenant, to impeach the Prince's entry. The Constable was sent from Melun to Paris on the 4th inst. On the morning of the 5th inst. he, accompanied by those who guarded the town, went to one of the places where the ministers preached in the Faubourg of St. Jacques, and there plucked down a piece of the house, and burnt the pulpit, forms, and chairs. Some of the Protestants were wounded, and some taken and committed to prisonFrom thence the Constable marched with fifteen or sixteen ensigns armed through the town to the palace, and in his march took prisoners many noblemen who were favourers of Protestantism, amongst whom were two advocates (Rusey and De Pree) belonging to the Prince of Condé, who were committed to the Bastile. A defence was made (not by edict, but by commandment) that there should be no more preaching nor assemblies. There was then great search made to take the preachers of Paris. On the same day (5 April) the King (accompanied by the Queen Mother, the Duke of Orleans, the King of Navarre, and the Duke of Guise,) repaired with their force to Bois de Vincent, two miles from Paris, where they lodged that night. 3. The next day (6th inst.) the King, accompanied by the same personages, left Bois de Vincent, and made his entry into Paris by St. Denis' gate, from whence he went to the Louvre. Albeit the most part of the King's train were armed, yet it is doubted whether this will stand as his solemn entry, but rather it is thought the King was brought hither to give credit to such things as shall be here ordained by the King of Navarre, the Duke of Guise, and the Constable, to whose proceedings the Queen Mother for fear is obliged to consent. The writer has therefore deferred treating with the Queen Mother according to the Queen's instructions given in her letters of the 26th ult., which he received on the 2nd inst. by Nicholas Lannier, one of her musicians, who here applies himself to such charge as was committed to him. 4. After the Prince of Condé made his answer to M. De Gonnorre, being informed the King meant to prevent his entering Orleans, he marched with all diligence thither, and sent M. D'Andelot before to enter the town, who entered in time, for the King's commandment had just come to prevent the Prince's entry. D'Andelot took such order therein that the Prince and Admiral entered with their force. Immediately afterwards, M. De Tree came hither to exercise his commission as the King's lieutenant, to whom the Prince said he and his company would obey the King's authority, and would help to keep the town under him. De Tree said that both could not be in one place, to whom the Prince answered that his departure would not be impeached. 5. Shortly after M. De Tree's departure, the King sent M. De Chimeau, Master of the Ceremonies, who had commission to declare to the Prince, the Admiral, MM. D'Andelot, De Jenlis, Subyse, and De Pienne, all Knights of the Order, to lay down their arms and disperse their forces, or to surrender to him their orders. The Prince answered, that being so near a kinsman to the King he was greatly touched to have such a summons, and on behalf of his companions he was greatly grieved to have the King's name so abused, for those who made no difficulty to lead the King, his brother, and the Queen Mother against their wills from Fontainebleau to Melun, and thence to Paris as captives, and to detain them there against will, would not stick to make him [Chimeau] to be their messenger in such an ambassade. He also said that all who accompanied him were the King's faithful subjects, and who meant to keep this, his town, to his commodity, and to surrender the same unto his hands when he came of age, and was free from captivity. He then dismissed De Chimeau, who returned to the Court. 6. The King sent the Bishop of Valence on the 6th inst. to Orleans to persuade the Prince to leave the town. This commission was given him, he being in great credit with the Prince and Admiral, and reputed a favourer of their religion. After they had conferred with the Bishop, he had no desire to return to the Court, but to stay at Orleans, or he found himself so ill-disposed as not to be able to return. Thereupon he sent to the King that if the Queen Mother would come from Paris towards Orleans, he would meet her at such place as she would appoint, and bring the Admiral and D'Andelot with him, provided hostages were given into Orleans for them, namely, the Princes of Navarre and Joinville and M. D'Anvile, the Constable's son. The Queen Mother accepted the offer, but the King of Navarre, the Duke of Guise, and the Constable would not accord thereto, so the said Queen could not accomplish the journey. 7. The King then sent M. De Gonorre again (accompanied by De Frêne and D'Allony) to Orleans to the Prince, with offers to entice him to abandon the Admiral and his company, whose answer had not come hither at the despatch hereof. 8. The Conté of Rochefocault, accompanied by a number of gentlemen from Poictou, is expected daily to join the Prince; so is M. De Roughan, with the force of Bretagne. The Gascons put themselves in force to march towards the Prince. It is said the Protestants have taken Bordeaux and many towns in those quarters; also Vienne, in Dauphine, and three or four other towns there. Blois is taken, and the castle. There is a rumour that they have taken the castle of Amboise, where are M. D'Anjou and Mme. Marguerite, the King's brother and sister. Tours and the castle are taken, where they found a good store of munition. Not far from thence is the rich abbey of Marmoutier, of which the Cardinal of Lorraine is Abbot, where the Protestants have defaced all the images and taken the relics and treasures of the church from thence, and given the custody of the same to the Governor of Tours to the King's use, suspecting that the Cardinal meant to take them to his own use. In most of the churches of Tours the images have been defaced. These proceedings are imputed to the doings of the Constable in this town, considering the King's edict of toleration for preaching in the suburbs was not revoked. The Constable is in as great hatred by the Protestants as any man in France. The Protestants being the strongest party at Rouen, they guard that town; where lately two captains, having commission to levy men to the number of thirty ensigns, entered the town, and beat their drums to assemble their bands, whereupon the people in a fury assailed them, and killed both the captains, saying the Duke of Guise, nor any for him, should levy men in their town. 9. The King has despatched his commissaries into Switzerland for 6,000 Swiss, and also to Germany for the like number of Almains, and 3,000 pistoliers. All the bands of the men of arms are summoned to repair hither with speed, except those belonging to the Prince of Condé. These men make great account of the King of Spain's aid, and his Ambassador here promises very largely; so does the Bishop of Rome and his adherents. The Queen's aid to the Protestants is more feared than all the Papists' subsidies, for all their great braggs. 10. There has been lately at Maestricht (betwixt Cologne and Antwerp) a Diet kept secretly, where the Count of Egmont met the Count of Swartzenburg, Lazarus Van Zwenden, and others of the King of Spain's Almain pensioners. He has informed Christopher Mundt thereof at Strasburg, and Mr. Fitzwilliams, governor of the English merchants at Antwerp, so that they may know what is concluded, and inform the Queen thereof.—Paris, 10 April 1562. Signed. Orig. Add. Endd. On the back are some genealogical memoranda by Cecil. Pp. 8. 1. His letters to the Queen show the state of France. She must take into consideration that the Protestants be not overthrown by the Papists." That will prove to Her Majesty and her realm too dangerous an accident if it should come to pass. Therefore, besides severe looking to the subjects at home to cut off and prevent practices and conventicles, you must animate and solicit the Princes Protestants with speed, by all the means you can, not to suffer the Protestants to be in this realm suppressed. I see I must be driven to use Her Majesty's comfort to the Queen Mother and that party in time, lest they and their cause quail for lack of courage." There is not a day passes but that the Spanish Ambassador, the Bishop of Rome, or some other Papist Prince's minister puts terror into the Queen Mother's mind. At his next audience it is necessary that he should use on the Queen's behalf some general words of comfort to her, and the like to be done by the Queen to M. De Foix would do much good. 2. If the interview with the Queen of Scots takes place, it will be necessary to have some wise man to stay at London, also one of the principal officers of the Admiralty (next to the Lord), or near the navy. If France, Spain, Flanders, Savoy, and Germany arm, it will be necessary for England to be in readiness for all events. Prays Cecil not to be unmindful of his revocation. The Lord of St. Colme cannot as yet have his despatch hence, the house of Guise being so perplexed at present. It will be better for Cecil to conclude with the Queen of Scots and her Council about the interview. Her Treasurer and Master d'Hôtel have requested of him the Queen's passport to pass from thence through England to Scotland with plate, money, jewels, horses, and other things for the said Queen. Desires Cecil to send the same to them to Dover, so that they may have it at their arrival. They intend to set forth from hence about the 14th inst. The steward is a Frenchman named Pegylian. Any favour shown to them in their journey will be thankfully taken by the Queen of Scots.—Paris, 10 April 1562. Signed. 3. P. S.—Desires Cecil to send this packet to M. De Foix. The other letter is from the Great Prior to Mr. Stuckeley. Orig. Hol. Add. Endd. by Cecil's secretary. Pp. 4. 999. John Frampton to Challoner. 1. Some days past Mr. Tipton received a letter from Challoner concerning the obtaining of that which was granted by the King to Sir Thomas Chamberlain for restitution of his creditors' goods by his books without any further suit at law. The answer to his letter Challoner sent by Mr. Tipton, wherein Challoner desires him to send Chamberlain's original letter, or a copy, so that he [Challoner] might cause the rest to be obtained which was granted, and that he might know what was obtained already, the which he sent to Challoner enclosed in another, dated the 5th inst., whereby he may fully understand his cause. The effect of Chamberlain's letter was, that he obtained of the King a schedule, whereby all his creditors' goods should be restored to the owners (without further law) by his books, and that the same was being made at his departure, and that it should be sent. The suit goes forward here, but it is tedious, and he knows not when it will end.—Seville, 10 April 1562. 2. P. S.—The post of his letters he will repay to Mr. Tipton for Challoner. Orig. Hol. Add. Endd. by Challoner. Pp. 3. 1000. Hugh Typton to Challoner. Copy of the letter of the 6th inst. (No. 984), with a P.S., to the effect that since the letter sent with the last courier here has passed nothing to advertise him of.—Seville, 10 April 1562. Signed. Sums due to workmen presently appointed to be cassed, for [blank] days, from 25 Dec. 1561 to 10 April 1562; viz., for 192 labourers at 8d., 10d., and 12d., per diem; sixteen carts and tumbrels, with the carters' wages, at 4s. 8d. apiece per diem; carriage of coals to the limekilns at 6s. per diem; and one clerk with six victuallers at 5s. per diem. Total, 100 days, 1,322l. 10s. 1. Randolph had originally written Monday.